iTM is a Testing Framework which includes processes, procedures, templates, tools, guidance and reference materials to cover the whole of the testing process for any type or size of programs or projects. Watch the video to see some of the iTM features. 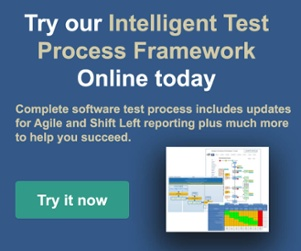 See below how iTM integrates with MicroFocus Silk Central test tool or to explore a subset of the framework yourself click on the link. The philosophy behind iTM is that when correctly and fully used as-is, it provides a robust and effective Testing Framework that enables organisations not only to improve testing and increase product quality but also to achieve compliance with the TMMi Maturity Level 5.
iTM does not tell you how to test a particular product. You are the experts in your own applications and must decide what to test, how to test and how to report. iTM provides the structure within which testing takes place. Further details are available to compare the version. The iTM Agile methodology is a hybrid of the many flavours of Agile available. The main methodology on which iTM relies is SCRUM, but with the inclusion of a number of techniques including Kanban and with recommendations for particular development techniques such as Test Driven Development. These recommendations are based on the techniques found most frequently in recent Agile houses that Experimentus has encountered. The principle process as described in iTM Agile is appropriate for all domains and all levels of risk and the basic framework, risk assessment and general approach to testing, monitoring and control will be useful for all projects. Organisations must, however, ensure that the test techniques, test levels and types and the relationship between them are defined according to the particular needs of a project. One of the tenets of Agile is that it is flexible. Even within the same organisation, there may be a need for a number of flavours of Agile and the Agile strategy can be adjusted accordingly while still maintaining the same iTM recommended control and reporting mechanisms. For organisations that are just moving (or thinking of moving) to an Agile paradigm, the base iTM Agile methodology provides an ideal place from which to start.